Over the past months, the code of Soldat underwent a major refactoring so it became possible to compile Soldat client using the FPC compiler which is much more modern compiler than previously used Delphi7. Thanks to these changes the work on the code is now much easier. 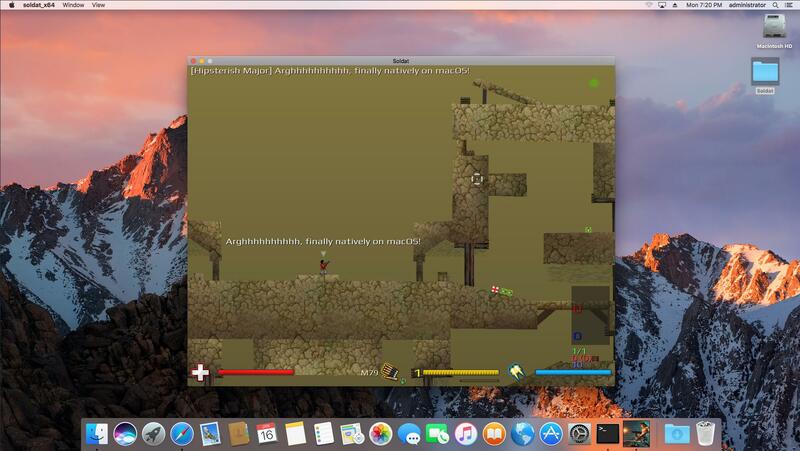 This has allowed us to port the game client to other operating systems - Linux and MacOS! Soon you will not need to use WINE/Vms to play Soldat natively on those systems! The next big change is the implementation of SDL2 library that gives us cross-platform way to manage Window and Input events. We are now also using OpenAL for a sound library. These changes are purely technical but they are among the most important changes over the last few years because of better maintainability. Awesome with Linux possibilities, sounds great! And thx for the devlog. Reading soldat devlogs is better than reading PC magazines! Plese fix bug, if im kick idle afk and game is minimized. after returned to the game, bad the scales can be seen only half of the window. Really looking forward to 1.8! Good job, guys! You guys should have taken over dev LONG ago! So happy about the mulit-platform thing. Also, good for pr related things. very nice.. good work guys! I am currently not noticing a lot of activity going around.. so just to get some hopes up could you answer my question? This is awesome news. Haven't logged in these fora for years but this GNU/Linux release was unexpected. When will Soldat be open-sourced? Nice! This is quite exciting!